Marta Ascencao scored a first-half hat-trick as Jersey thrashed Guernsey 7-0 in the women's Muratti at Footes Lane. All three were headers, while Catarina Alves-Andrade added two goals, with Jess Vieira and captain Jodie Botterill also on target in the rout. It is Jersey's seventh successive Muratti victory, with Guernsey scoring just three goals in that time. 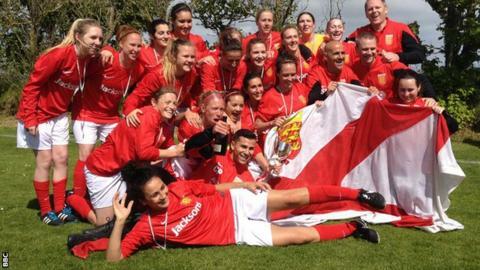 "The girls were swarming all over Guernsey and I think 7-0 flattered them," said Jersey boss Simon Petulla. "We pretty much dominated from start to finish and everything we've practised in training came through." Guernsey had won the first five Murattis between the islands, but have now lost in 13 of the last 14 years. Jersey also prevailed against the odds in the men's final, winning 3-2 despite a late comeback. "We've gone from being a good team to being a great team," added Botterill. "This is my 13th year in the team and I think this is the strongest squad we've had. "We like to think it's our trophy, so we don't like them to get it back. We like to keep it at home every year."